Sunshine Coast trails map is available in several formats - a water-resistant paper map, two mobile apps (one for iPhone and one for Androids), and eBooks for your convenience. However all of the information on this website is free. As long as you are only using the information personally all of the maps and trail descriptions can be copied and used by you as you wish. I am very excited to now be able to offer water-resistant Sunshine Coast trails map. They are available from the PaceSetter Athletic, Gibsons Visitor Centre and Spin Cycles in Gibsons, Experienced Equipment in Roberts Creek, Alpha Adventure in Wilson Creek, Off the Edge Adventure Sports, Source for Sports and the Visitor Centre in Sechelt and the Earth Store in Pender Harbour. If you prefer, you can purchase a map here and I will mail it out to you. Please provide a mailing address during Check Out. Click on the Add to Cart button below. The mobile app provides a Sunshine Coast trails map that represents the lower Sunshine Coast including most trails, logging roads and some streets. It also provides elevation information and assuming you have gps service where you are, a “you are here” function. The iPhone app can be found in the Apple App Store under the name Trailmapps: Sunshine Coast. The Android phone app is located at Google Play under the same name - Trailmapps: Sunshine Coast. Here is a link http://bit.ly/UlRxFM. The cost for each app is $10. Below is a screen shot of the West Sechelt (Wakefield Matrix) map from the mobile app. As mentioned above, there are two pdf bookets available for purchase. 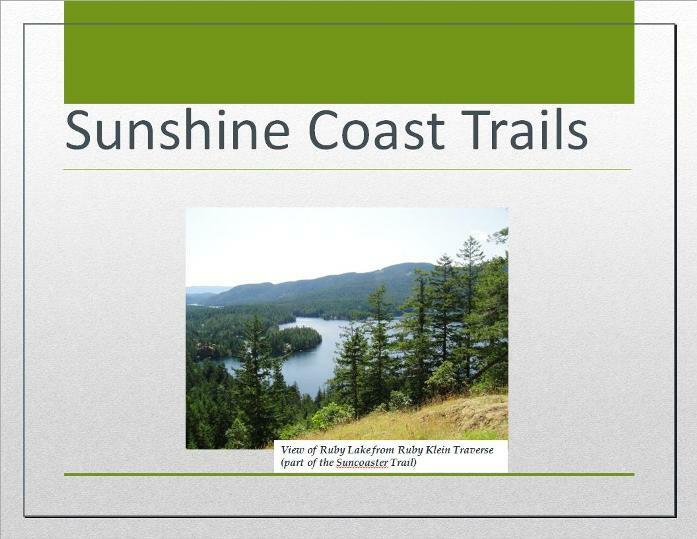 The first booklet is 47 pages and is called Sunshine Coast Trails. 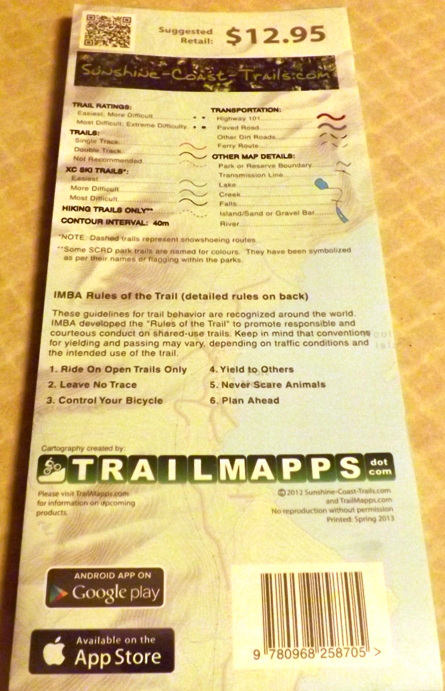 It includes all of the area maps and trail descriptions. 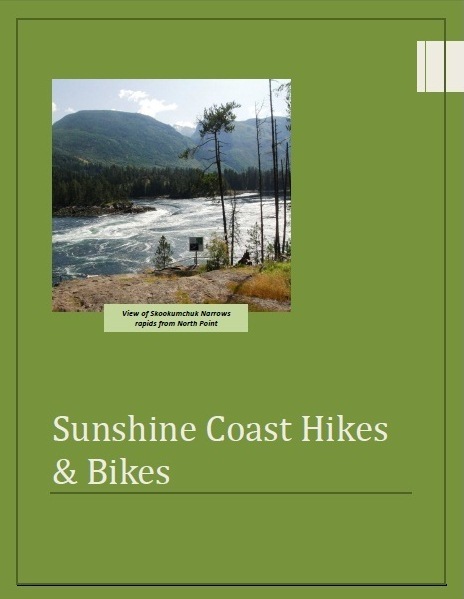 The second booklet is 73 pages and called Sunshine Coast Hikes & Bikes. 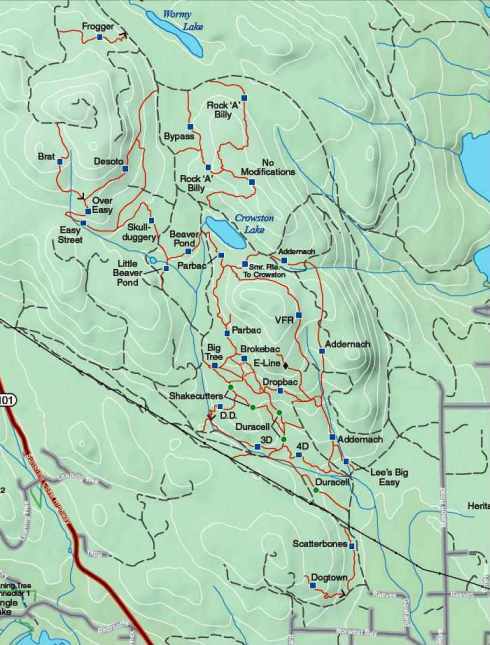 It includes all of my favourite hiking and biking routes from the website. Click on the Add to Cart button below each of the book covers to purchase that particular eBook in pdf format (cost $8.00 each). Check Out is processed through a very secure server via Paypal. You DO NOT need to have a Paypal account to be able to complete your purchase. When you get to the Paypal page, just click on the link "Don't have a Paypal Account? to pay with your credit card. If you live locally, booklets are available for purchase at the Sechelt Tourist Information office in Sechelt. Click here to return to the Sunshine Coast Trails Home page from the Mobile Apps and eBooks page.